Believe it or not, there is still a large part of the population that still have landline phones in their home. Although cell-phones are a primary concern for anyone worried about the dangers of EMF radiation, cordless phone radiation from home phones is still a significant risk. Many people think about getting a home phone specifically to reduce their exposure to cell-phones, but you certainly want to be careful about what type of phone you purchase for your phone. In this article, we’ll talk about the different kinds of cordless phones, why they are dangerous, and simple and effective ways you can reduce your radiation exposure. Why Are Cordless Phones Dangerous? To understand this we need to talk a little bit about how these phones usually work. First of all, almost all cordless phones use a technology called DECT (Digital European Cordless Telephone) technology. With DECT, both the cordless handset and the base station both constantly emit large amounts of radio frequency (RF) radiation, a form of electromagnetic frequency radiation. This is dangerous in two ways. Proximity: First of all, just like with cell phones, the proximity of our head to the source of radiation is a huge danger. When it comes to EMF radiation, we use something called the inverse square law of physics. This law simply states that as we double our distance from a source of radiation, we quarter our exposure to it. So when we gain distance from things like smart meters, routers, cell towers, etc. we see exponentially lower dangers as we get further away. With a cell phone, or in this case a cordless home phone, there is no distance between us and the source of the radiation (the headset) and so we don’t benefit from this law at all. Throughput: The second issue is the way the transmission work. Both your voice, and the voice of the person you are talking to must pass from the headset to the base station, and then on through the phone network. This means that depending on your orientation, and distance, from the base station, those transmissions may have to go through your brain to get to the base station. The further you are away from that base station, the harder the phone has to work to transmit that information. One way to think of it is to think about Apple Airpods (which are very dangerous in my opinion). These Bluetooth earbuds don’t both transmit to your phone at the same time. One earbud receives data from the phone, and then passes it to the other, right through your brain. Cordless phones work essentially the same way, depending on where you are holding the phone in relation to the base station. 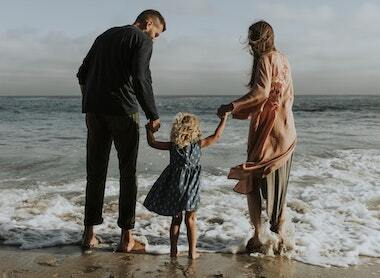 Although we primarily associate EMF radiation risks with cell phones, a study published in 2006 found that cordless phones, and cell phones, both emitted dangerous levels of EMF radiation, and both increased the risks of certain brain cancers. Swedish scientists studying the link between cordless phone use, specifically DECT phones, cell phones, and cancer, found a significant correlation. Not only can they be dangerous to use and operate, but they also emit a surprisingly large amount of EMF radiation even when they are not being actively used. This adds to the overall EMF pollution of your home. Before we had cordless phones, we had standard telephones where you had a cord from the headset to the base station and a telephone cable from the base station into the wall and onto the telephone pole. This allowed the phone to both be grounded, and not transmit anything wirelessly, making it’s EMF emissions virtually zero. However, when these phones were replaced with cordless phones, and eventually high powered DECT phones that pulsed EMF radiation, we were simply too blinded by the convenience to even see the danger. However, once cell-phones gained popularity, it brought to the public attention that these devices may actually pose a serious danger. Fast-forward to today, when we have a wealth of studies and data showing that consistent long-term cell phone use increases our risk of things like glioma (a type of brain cancer) and other health risks. This also helps us to understand the danger that cordless phones pose. Are Cordless Phones More Dangerous Than Cell Phones? Now, this depends, and I’ll tell you the primary reason I say that. In today’s world, even if we have a cordless phone at home, we tend to be on our cell phones far more often. This is the case because nearly all cell phones used today are also smartphones. Meaning we use them for email, texting, games, productivity apps, skype calls, and a hundred other things. This means that we just simply have a tendency to use our cell phones far more often. On top of that, cell phones emit more than just RF radiation. They also emit magnetic and electric field radiation from the circuitry inside. Now one of the primary exceptions to this would be if you sleep right next to a cordless phone. Since both the headset and the base station emit EMF radiation, the combination in close proximity to your head could be a significant danger. This is becoming less common though. Significantly more common is sleeping next to our cell phone, or even sleeping with our cell phone under our pillow. If you’ve read my article on how to reduce radiation in the bedroom, you’ll know just how dangerous this can be. This article also gives some really helpful tips on what you can do about it, so I’d encourage you to check it out. Are Corded Phones Less Dangerous Than Cordless Phones? Just like we talked about before, since both the headset and the base station, are wired, the EMF emissions are far lower. The machine will be grounded, and the data transmissions will go through the telephone wire or ethernet cable, virtually eliminating your exposure. Even today you can still get simple, but effective, corded phones from places like Amazon. This is a fairly common general rule, that whenever you can find a wired or corded version of a wireless product, it’s probably going to be safer. Whether that is a wired mouse, keyboard, headset, ethernet cable, or anything else. Some people may ask about analog wireless phones, like this one from Amazon. Although these are a bit better than a DECT wireless phone, they still will emit more EMF radiation than a corded phone. They work at a lower frequency and don’t have a pulsed signal. However, I would still try to just go with a corded phone whenever possible. Take a look at the video below, which gives a quick and concise look at the radiation exposure difference between a cordless DECT phone, and a simple corded phone. You can see that even when the cordless phone isn’t being used, it still emits a large amount of EMF radiation. Are There Low EMF Cordless Phones? I haven’t personally tried these phones, which you can pick up on Amazon. However, after reading through a ton of reviews, it does seem to be that when the phones are in standby mode, they emit almost no EMF radiation. You do need to configure the settings yourself to be sure that it is in the correct ECO modes to lower the radiation emissions. 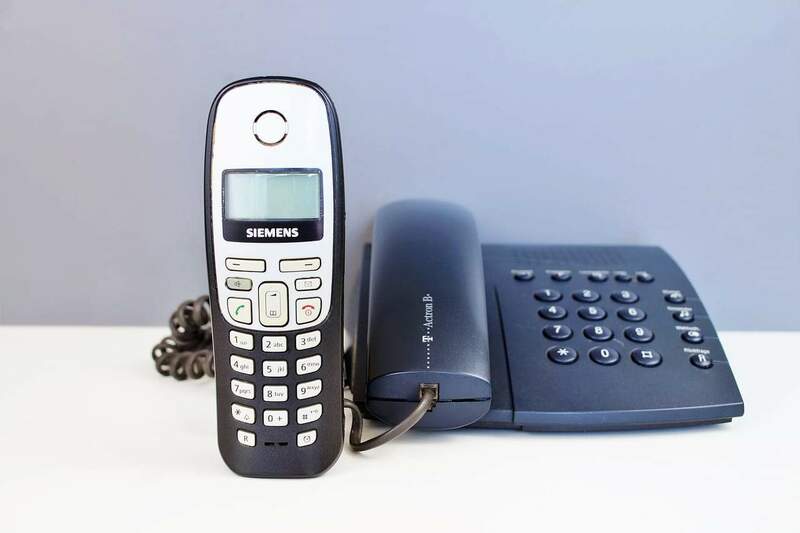 There are a few other companies on the market that make lower EMF cordless phones that you can look into, however, I would highly suggest you still just look into using a simple corded phone for home use. These VoIP phones with headsets are an enormous EMF exposure risk. Having a headset on your head that is constantly communicating with the base station attached to your head for 8 hours a day has huge cumulative exposure risks. If possible, try to make changes in your office space to reduce this risk, such as using a corded headset instead of a cordless one. Also, try to move your phone a bit further away from your body. Obviously, the best thing you could do is to just stop using a cordless phone, and replace it with a corded phone if possible. However, this isn’t exactly the easiest or simplest solution. One of the first things I would do though is to get an EMF meter. 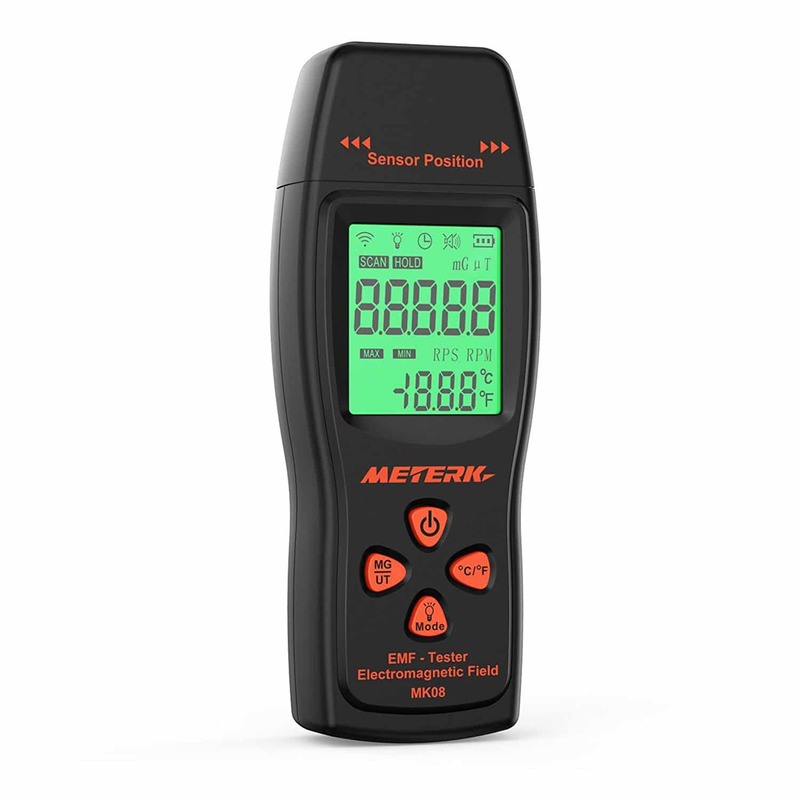 I know that this doesn’t immediately reduce your radiation exposure, however having a quality EMF meter is one of the absolute most important things you can do if you care about the dangers of EMF radiation. Not only does it allow you to gain a better understanding of the amount, and kind, of EMF radiation in your home, but it also helps you to eliminate it. 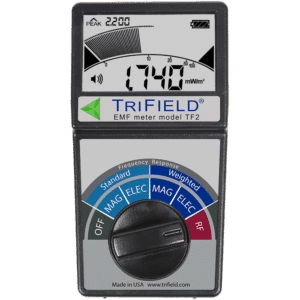 The EMF meter will help you to fully understand how much EMF radiation your cordless phone is exposing you too. Even more importantly though, this is an invaluable tool in your journey to lower your overall exposure to EMF radiation. If you do have a cordless phone, simply unplug it at night. This will dramatically lower the EMF exposure from the device. However, be careful that you don’t leave the headset close to your body even when it is unplugged. As the headset continually tries to re-establish a connection with the base, it can emit a fairly large amount of radiation. Try not to have your cordless phone permanently in places that you spend the most time. It is common to have the base station on a side table next to your recliner, or on your nightstand next to your bed. Instead, try not to have the base station or the headset within about 8 feet of where you spend idle time such as sleeping or watching TV. Just like in my article about reducing cell phone radiation, a great way to reduce your exposure to cordless phone radiation is to use speakerphone when possible. Instead of holding the headset right against your head, turn the speakerphone on the base station on. This gives a good amount of distance between you and the source of the radiation. Although home phones are not that common anymore, you’d be surprised how many homes and offices still have cordless phones. Making these simple changes suggested above can go a long way at reducing your overall exposure. If you found this article helpful, please consider sharing it!